Earlier today, CBS officially named Stephen Colbert as its new Late Show host, putting to rest the question of who would take over for David Letterman that had captivated us, ever so briefly, into caring about the inner workings of a late-night talk show. But as these things go, answers only beget more questions, and those questions beget articles where they’re put into list form, and so on, until we all feel included. Here are the Top 10 most pressing. 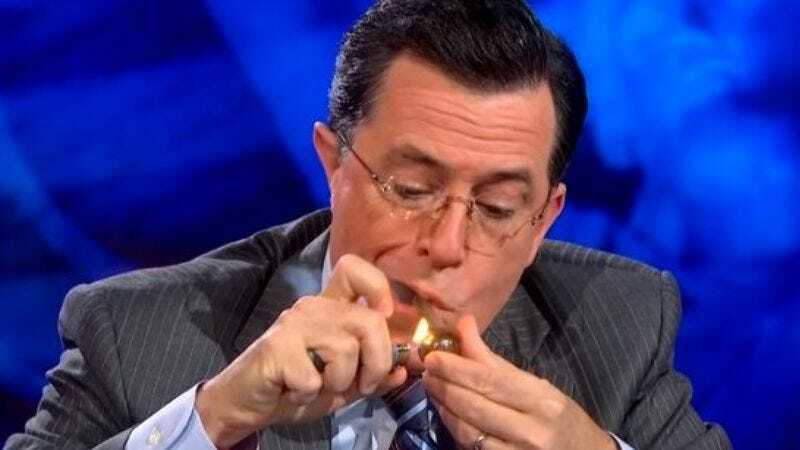 What will happen to The Colbert Report? What will happen to his character, “Stephen Colbert”? He’s not going to do that stuff on the Late Show, is he? No, Stephen Colbert will not be portraying an oblivious neo-con blowhard while talking to actors who are just trying to promote their latest movie. “I won't be doing the new show in character, so we'll all get to find out how much of him was me. I'm looking forward to it,” Colbert said in a statement. Okay, so what will his show be like? That’s still being determined. The Hollywood Reporter says early speculation has it being more of a “variety show,” one that could incorporate some of the political satire that’s made him famous. But despite Colbert taking his Colbert Report writing staff with him, that’s obviously just talk at this point. Right now, without even a producer attached (Letterman’s Worldwide Pants isn’t likely to be involved), nothing is set in stone, including the show’s format or even what location it will shoot in. Though as you might imagine, both Los Angeles and New York are already angling to be its new home, as these are the only two cities that have the precise, rarified balance of nitrogen and oxygen that celebrities require to breathe. Anywhere else, and they would just be flopping around like dying fish. Everyone who steps off the plane in Chicago automatically gains 15 pounds, so probably not. Who will take over The Colbert Report? No one. It’s called The Colbert Report, not the Some Jackass Report. But as to who will take over that post-Daily Show slot, that’s something Comedy Central is also trying to figure out. Right now, all options appear to be on the table—including not having another talk show there at all. THR and Deadline both point out that the Chris Hardwick-hosted @midnight is doing very well for the network, so it’s possible it could get bumped up to the 11:30 p.m. slot and pass off its name as “ironic” or something. But there’s nothing concrete yet. I’ve never seen @midnight. Is it good? It’s not bad. Depends on the guests. Boy, in retrospect, it kinda seems like John Oliver should have hung in there a little longer, huh? That’s not really a question, but yes. It might have worked out better for everyone. Oh well. What does this mean for Craig Ferguson? In the immediate future: money. Ferguson’s contract with CBS grants him an automatic payday if he’s passed over for Letterman’s job—a windfall that the New York Post estimates at $5 million, while the New York Daily News says he could make as much as $12 million. As to whether Ferguson will stick around after his contract expires in June, well, that remains to be seen. Though losing the Late Show, combined with those recent talks about Chelsea Handler taking his place, certainly suggest those talks might be a little tense, to say the least. What about his competition, the two Jimmys? They’re also being nice about it. You know, some of these questions seem superfluous, like you only added them to get your cheap “Top 10 list” reference in the headline. Again, that’s not a question. But yes. So what? I’m just saying, I thought maybe you were better than that. Well, you were wrong. Maybe you have unreasonable expectations, according to some arbitrarily defined code of “integrity,” whatever that means. You’re right. It’s a real problem of mine. I don’t know why I can’t just enjoy things for what they are. It’s okay, buddy. Let’s go have a drink.